There are master storytellers. There are brilliant filmmakers. But none can compare to Steven Spielberg in terms of authentic storytelling to create pure movie magic, in such an approachable way. For me, there were three Spielberg films that shaped my childhood. During my early years we dealt with many of life’s struggles often due to poverty, but our single-parent mom battled even tougher struggles with breast cancer. It was during these years of hardship, that I found a companion for the ultimate escape via the movies. Steven Spielberg created his vision of cinematic storytelling with his own unique camera style and his instinct of character development in way that allowed us to escape to magical places yet at the same time made us feel very much at home. It was the Spielberg effect. JAWS was a breakthrough film for Steven Spielberg and the experience had a lasting affect on us too. This movie, despite all the woes the mechanical toothy beast gave this director, was still able to scare the heebie-jeebies out of us. Hell, I couldn’t even go near the deep end of a public pool in the later half of the 70’s without some irrational concern of a potential ‘Great White’ lurking about. Besides utilizing a slowly building tension to thrill and terrorize us like only the best master filmmakers of suspense thrillers do, he added a few other tricks to pull us into the story. The scene is real, it’s family, it’s sweet and it’s very relatable. Yet most filmmakers would find it completely unnecessary. Many directors wouldn’t bother to take the time this scene took. But that’s exactly why it works so damn well. We understand this poignant little moment. It feels real to us. Now we are fully invested in these characters. Escapism and movie magic is vibrantly alive in this film. It felt like the first time mass audiences were shown a transition from ‘aliens are scary attackers’ to an obsession of curiosity reflecting a positive, if not rather cute, view as friendly, celestial travelers. And we make this transition during the film itself. Many alien subject films prior to this point were often campy SciFi B movies- some the direct result of a post WW2 Cold War fearful state of mind. In the beginning of CEOTTK, we continue this fear of the unknown as the alien interactions are presented as a series of scary encounters and abductions. By the end of the film, we are thoroughly charmed by the aliens and our curiosity transitions from an obsessive fear to a desire to explore the galaxy as their traveling companion in a grand once-in-a-lifetime adventure. But here again it’s the combination of this ‘let’s escape to a mysterious world via movie magic’ along with his masterful ability to develop characters we ‘get’ in tender detail. Case in point, we see Richard Dreyfuss return once more as a main character. This time Dreyfuss is Roy- a family man, just working his way through the routines of an unfulfilling life. He’s a blue collar working man, an every-man; trying to pay the bills while quietly seeking some peace with his chaotic family life. This father figure is shown as more flawed and vulnerable this time and this family is less willing to accept his vulnerability and his departure of conforming to the norm. In the end, the family abandons him and he never returns to his wife and children, rather opting for a life of adventure and unique purpose. After becoming a father himself years later, Spielberg said he regretted concluding the story with the father figure choosing to leave his children. As unconventional as that must have been as movie formulas go, it didn’t hurt Spielberg any at the box office. And I believe it was another example of relatable realism of what so many American families were dealing with in their own lives in the late seventies, just as divorce rates were making an unprecedented rise for the first time in history. Spielberg wanted to create an action-packed adventure, featuring a charismatic hero that was inspired by the serials he recalled from his youth. Spielberg continued his passion for inventing pure movie magic with one of his most adventurous and unforgettable characters to date. In a departure from his last two hits with JAWS and CEOTTK, this film focused almost entirely on action, adventure and even a little old-fashioned romance, too. There was much less focus on the ‘relatable realism’ to feel a connection here. Yet because the main characters of Indiana Jones (Harrison Ford) and Marion Ravenwood (Karen Allen) are off-the-charts charming in their chemistry, we desire to be connected- we wish we were those characters. Jones is not a cookie-cutter nor a flawless type of hero. He has his ordinary weaknesses (like fear of snakes) and much of his average guy ways can be found in facial expressions during conflicts. He doesn’t take time for vanity nor accolades. He’s just an academic geek obsessed with archeology who happens to find himself in these troublesome spots and we assume he’s learned to develop great skill in action to serve his purpose well. With every close call it’s though he almost lucks his way out of every dire situation. Marion is the feisty, put-up-with-nobody’s malarkey gal that I personally felt a connection. She has a tough side and a sweetly feminine side, too. She does whatever it takes to get the job done and she’s willing and able to come along for the journey, as bumpy of a ride as it may be. Just like Jones, she’s not out for the glory, she’s a survivor. In all this constant action, Spielberg does take a break for a “quiet little moment” scene with these appealing characters. After suffering multiple injuries, the two find themselves en route in a room on a boat. He’s in terrible pain (partly due to Marion herself whacking him with a mirror) as he attempts to take off his shirt. Marion energetically tries to help him but he winces in pain. She then sweetly kisses him on the elbow when he claims that’s the only spot “where it doesn’t hurt”. He then points to his forehead and another place on his face, each time Marion gently placing a kiss. Finally he points to his lips. After a passionate kiss, Jones promptly falls asleep in complete exhaustion. It’s yet another example of Spielberg taking his time to include a very human, tiny exchange with his well-developed characters. In the summer of 1981, after five years of struggle, my mother lost her battle with cancer and we moved back to Kansas City to live with family. Many of the tiny character moments via these Spielberg films, I felt a connection in some piece of my life. And with every magical journey Spielberg took us on via these films, I was happy to escape. I felt at home with this cinematic traveling companion. 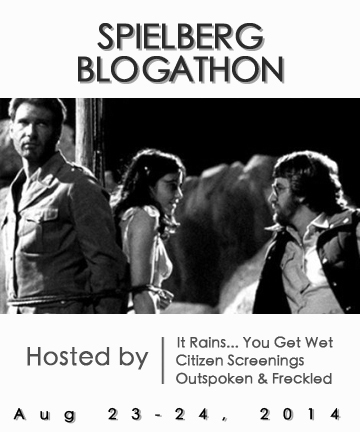 *This post is part of the SPIELBERG BLOGATHON hosted by IT RAINS… YOU GET WET, CITIZEN SCREEN and yours truly taking place Aug 22-23. Please visit these blog host sites for a full list of participating blogs. Nice piece. People forget, unlike other blockbuster filmmakers he’s been grouped with, Spielberg is interested in those little moments. Admittedly, he can get overly sentimental at times in those moments, but he normally does them as well as the ones described here.